Combine chilli sauce, soy sauce and vinegar in a bowl. Add pork and marinate for 10 minutes. Strain pork and reserve marinade, stirring in orange juice. Spray a wok or large frying pan with oil. Add pork and stir-fry over a high heat for 2-3 minutes until golden. Remove from wok. Spray wok with a little more oil and stir-fry ginger, onion, capsicum, broccoli and carrot for 5 minutes, adding 2-3 tablespoons water. 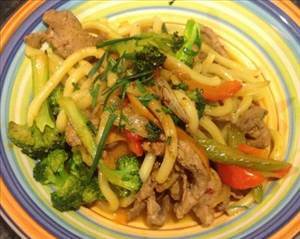 Return pork to wok with noodles and reserved marinade. Stir over a high heat for 1 minute until heated through. Serve garnished with coriander or chives if desired. There are 258 calories in 1 serving of Sweet & Sour Pork with Noodles. Calorie Breakdown: 11% fat, 51% carbs, 38% prot.